Matthew Emigh, J.T. 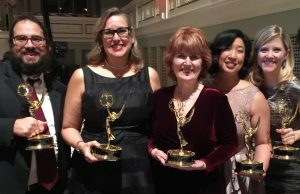 Ellison, Beth Curley, Linda Wei and Mary Laura Philpott at the 2017 Midsouth Regional Emmy Awards. Nashville Public Television’s A Word on Words received an award in the Interstitial category at the 31st Annual Midsouth Regional Emmy Awards on January 21, 2017, at the Schermerhorn Symphony Center in Nashville. Statuettes went to producer Linda Wei; photographer Will Pedigo; editor Matthew Emigh; hosts J.T. Ellison and Mary Laura Philpott; and executive producer Beth Curley. 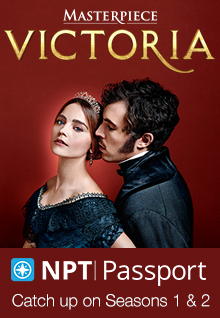 NPT productions went into the awards with 4 nominations. Also during the awards ceremony, NPT producer Ken Simington was posthumously inducted into the Silver Circle with a video tribute and an acceptance speech by Joe Elmore, host of NPT’s popular Tennessee Crossroads magazine program. Simington, who died in August of last year, was the longtime executive producer of Tennessee Crossroads. The Silver Circle honors those with at least 25 years of service to the television industry and who have made a significant contribution to the community and to Midsouth television. NPT would also like to congratulate our friends and partners on their Emmy wins, including Todd Squared (Bluegrass Underground; Nitty Gritty Dirt Band & Friends – Fifty Years, Circlin’ Back! ); BoneSteel Films and Concentrix Music (America’s First Forest: Carl Schenck and The Asheville Experiment). For a full list of winners please visit the NATAS-Nashville Chapter website at http://emmynashville.org/awards/. This entry was posted on January 23, 2017 at 12:21 pm. You can follow any responses to this entry through the RSS 2.0 feed. You can leave a response, or trackback from your own site. 2 Responses to "NPT wins 2017 Midsouth Emmy Award; Producer Simington Honored"
Ken and the crew did a story highlighting my business Monchita’s Homemade Cobblers, and I am forever indebted to NPT. Ken made a difference, we actually contacted each other from time to time just to say hello. His last email he sent to me is hanging on my wall, I keep it there for encouragement, and will now make it a memory of friendship. May Ken rest in heaven, there is no other place he would rather be. We miss Ken, too. Thanks for sharing that wonderful memory.